This one is a bit of a hot potato – and at the same time it is not, depending on which type of cable we’re talking about. Occasionally, we will come across a cable where the ends are marked in such a way as to suggest it is intended to be used in a specific direction. On some cables, the plug colours are different, on others there are ”guitar” and ”amplifier” markings. Yet others simply have a ”grounded end” marking on one of the plugs. What is all this, and does it make a difference? And is there any truth to the idea that some guitar cables can be directional? Read on… And as usual, we’ll start with the basics. The term ”directional” implies a certain direction – in this case the direction the cable is intended to be used in. Sometimes, the term ”uni-directional” is used, but it is often not used correctly. A true uni-directional cable can only be used in one direction – it won’t work the other way. A regular mike cable (female XLR -> male XLR) will only work in that specific direction, due to the plug/jack convention used. Sources (mikes, DI boxes, main outputs on mixers etc) always use a male jack, while destinations (mike inputs on mixers, inputs on power amps etc) always use a female jack. So while the mike cable itself doesn’t mind which way around it is running, the plugs dictate the direction it can be used. However, guitar cables use male jacks at both ends, and most – if not all – of the ones discussed here will actually work both ways around. Possibly not as good, but they will conduct both ways. This is why the correct term would be ”directional” rather than ”uni-directional”, since they have a preferred but not absolute direction. A cable that has no preferred direction at all or other reasons to use it in a specific way would be called ”bi-directional”. Just for reference, this is the regular type of guitar cable used almost universally. It is a coax type cable (pic to the right shows a Klotz AC104), with one center conductor and a shield around it. The center conductor is used as the ”hot” (connected to the tip in the plug) with the shield soldered to ground (connected to sleeve in the plug). There can be a few different reasons why a guitar cable would be marked for use in a specific direction, and some of them are perfectly reasonable, while some are (in my opinion, of course) less so. This is by far the most common type of directional instrument cable, and it has some sound theory behind it. Rather than a coax cable as in the above example, this one uses a cable with two inner conductors and a shield(the pic to the right shows a Klotz MY206). The two inner conductors carry the hot and ground (tip and sleeve, respectively), while the shield is only connected to the sleeve at one end. This plug is often marked ”shielded end”, or ”amplifier”. The idea is to connect the shielded end towards the amplifier, so the noise picked up by the shield is sent to ground at the end of the cable run, rather than having to travel up the cable to the guitar to get mixed in with the guitar’s signal ground from the start. 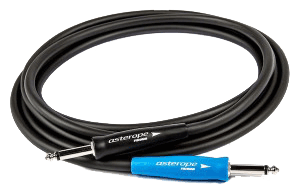 If you have pedals in between the guitar and amp, both the guitar and pedals->amp cables should be run the same way, with the shielded end closer to the amp. The plugs are sometimes clearly marked ”instrument” and ”amplifier”, while other times only the end where the shield is connected is marked, more or less clearly (see the picture for an example of less clear marking). This type of cable is directional because the one of the plugs have special functions that need to be at the guitar end. 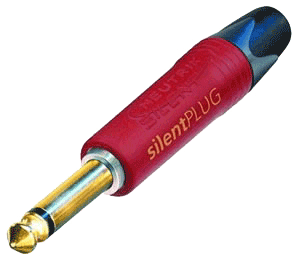 For instance, the Neutrik Silent plug (pictured) or Planet Waves Circuit Breaker, which mute the sound as you unplug it from the guitar, so you can switch guitars quietly. This plug obviously needs to be at the guitar end for that feature to work (the Neutrik mutes automatically, while the Planet Waves has a switch you activate to mute it). The cable itself can be a regular coax cable, or it can be a two conductor cable with the plugs soldered in the ”shielded end” style mentioned above. Another special cable would be the buffered type. This is quite uncommon, but over the years I have seen a couple of cables with small buffer amplifiers built in. Also, a while back Gibson released the ”Memory cable”, which contains a small record/playback unit. Both of those are obviously ”uni-directional” in the true sense of the word (since the active circuits can’t be run backwards). There may be a few more out there as well – I remember seeing a ”Zerocap” cable that had a small box at the amplifier end, to manipulate the cable’s properties. 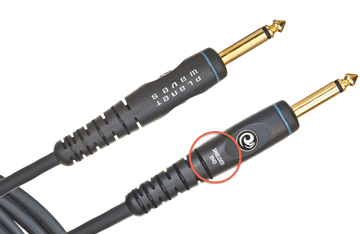 Also, Neutrik has the ”Timbre” plug, which has a small knob on it that lets you adjust the cable’s tone. This is also intended to be used at the guitar end, and would therefore mean you’d have to keep track of which end of the cable goes where. Now, this is where the potato starts getting hot… Some cable manufacturers – primarily in the very expensive range – claim their cables are directional in the sense that they are designed to let the signal flow better in a specific direction. These are not to be confused with those that do the ”shielded end” trick, and often use regular coax type cable. Some of these cables do that too, but also have some type of ”flow of electrons” claim attached to them, to explain why it has a preferred direction. There is plenty of myth and discussion about this topic, and while some claim there is some directionality to any cable that has been ”drawn” (a technique used to form the cable), most of them also say the effect is so small you would never be able to pick it up in a blind test. And then there are those who swear they can hear a clear difference. I can’t, but then I haven’t spent the ridiculous amounts of money asked for the really super-high-end stuff (where these types of claims most often turn up). Twisted pair cable – this is the type used for balanced mike cables, and also the ”shielded end” type mentioned above. So if you see this term being used in the sales pitch, you’ll know it’s most likely that type. Polarity optimized – this turned up recently, and I can’t figure out what it’s supposed to mean. To me, ”polarity” means where + and – go, and as long as the cable is connected correctly (with the tip going to tip in both plugs, likewise with the sleeve), it would have the correct polarity. There’s not really any room for ”optimizing” there – it’s either correct or it isn’t. So, does the directional cable thing actually work? Well, at least the theory behind the ”shielded end” type of cable holds water – it does make sense to avoid mixing the noise in with the signal ground until at the end of the cable run. But I have to be honest – I can’t say I have noticed any significant difference in noise levels with this type of cable, compared to a regular coax with the shield soldered at both ends. That doesn’t mean you should use the ”shielded end” type cable either way – again, by the theory proposed, if you plug the shielded end into the guitar, the noise picked up would have to travel all the way back to the guitar, before being shunted to ground via the negative inner conductor. So if you have one of those cables, I’d suggest using it as intended. And then there’s the ”polarity optimized” or ”preferred signal flow” type of cable… Honestly, I find this to be a load of… well, you know. I can’t see how that would make any difference whatsoever, or at least not any noticeable difference. And since those cables generally cost 5-10 times more than a regular cable, I’m not even going to go there. I also find that the more complex terminology used (”aligned crystal nodes”, or what have you), the higher the likelihood is that it’s snake oil. But your mileage may (and probably will) vary, so… this is just my opinion.